What do I wear with: MOMA 75301 Wingtip Oxford? Each Wednesday we’ll answer the on-going question: “What do I wear with these?” It’s a question we get quite often here at the shop and we love giving suggestions when helping our customers. This week we feature the MOMA 75301. This week’s inspiration for “What do I Wear Wednesday” comes from MOMA. Seattle is having one of the best summer seasons in recent memory. But it is August and the shop is getting ready for fall (though we would rather stick with the sunshine). Sometimes transitioning your wardrobe from summer into fall can be tricky but it really doesn’t have to be. 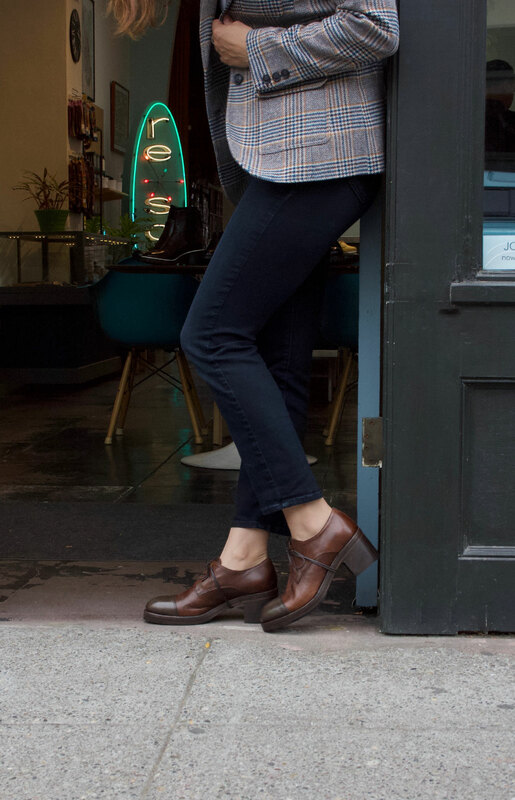 These wingtip oxfords are a great choice for when it’s too hot outside for boots and when sandals are not an appropriate choice for work attire. The emerald color is deep and rich and will compliment your core clothing basics of grey, brown and navy. Wear them casually with jeans and a breton top, or with a silk shirt and trousers. You can also wear them with a flirty dress and blazer for a boy-meets-girl look. Now we ask, are you ready to think about Fall? > MOMA 75301 wingtip oxford in emerald, made in Italy. > Aunt’s and Uncle’s “Goody” bag in nut brown leather. > Alessi Luna watch in teal green. > Laura Lomdardi “Votum” brass necklace.